This guideline provides evidence-based recommendations for Registered Nurses (RNs) and Registered Practical Nurses (RPNs) related to the care of individuals who are at risk for behaviours that may result in harm to self/others and lead to the possible use of restraints (physical, chemical, environmental). Unless otherwise indicated in the guideline, the discussion focus is on physical restraint. It is the intent of this document to assist RNs and RPNs to focus on evidence-based best practices within the context of the nurse-client relationship and on strategies for assessment, prevention and use of alternative practices (including de-escalation and crisis management techniques) to prevent the use of restraints, and move towards restraint-free care in diverse settings such as acute, long-term and home health-care. Nurses play a significant role in client safety through implementation of alternative strategies to prevent the use of restraints and to avoid the potential harmful outcomes associated with the use of restraints. It is acknowledged that this guideline cannot encompass all organizational settings and populations due to lack of research in some practice areas. This guideline seeks to bring forth the best available research findings in the form of recommendations. However, we do support the review of Promoting Safety: Alternative Approaches to the Use of Restraints by nurses to identify the best practice recommendations most appropriate for implementation within any institution that pertains to the practice of nursing and within the context of any Federal and Provincial regulations governing the setting and populations served. Restraint Use Focused on Client Safety. 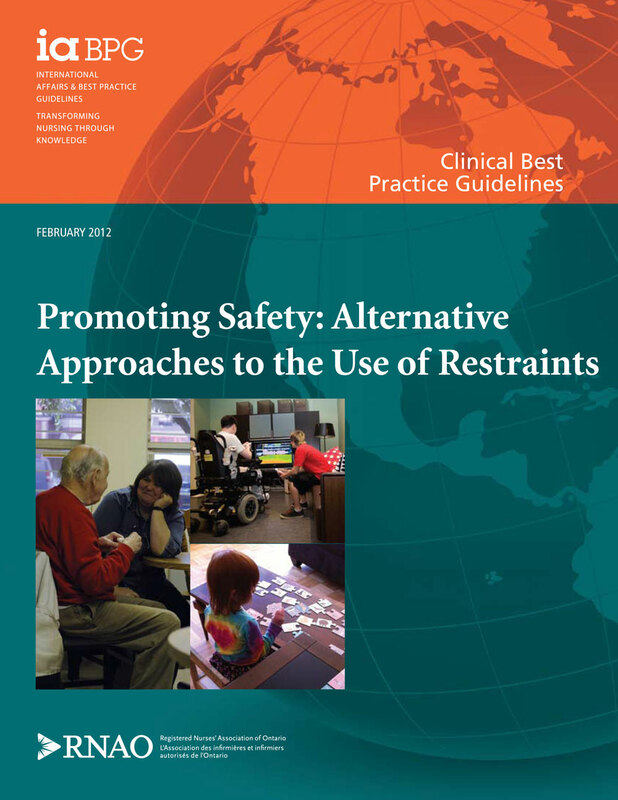 This guideline can provide support for nurses who are considering the use of restraints as a last resort, for the shortest duration of time when prevention, de-escalation and crisis management strategies have failed to keep the individual and/or others safe. It is important that nurses, in collaboration with the interprofessional team, know their client’s history (trauma/preferences) and work with the client to identify alternatives to the use of restraints and if needed, the best restraint option to be used as a last resort. Nurses working within organizations must be aware of the organization specific policies and procedures in order to identify what is a restraint versus a Personal Assistance Service Device (PASD), and what monitoring and observation practices must be in place when restraints are used. It is acknowledged that effective health care depends on a coordinated interprofessional approach that incorporates ongoing communication between health-care professionals and clients/families and substitute decision-makers (SDM).